Cozonac is one of the festive dishes we enjoy on special occasions in Romania, be it Christmas, New Years Eve, Easter, or a wedding. 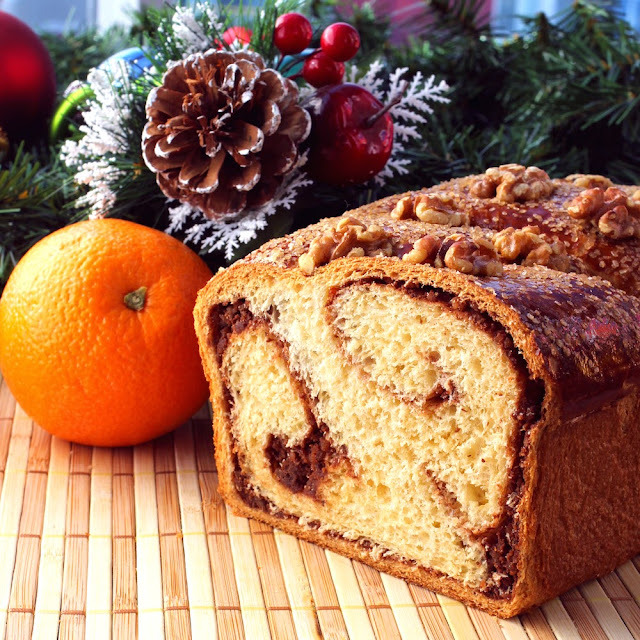 I remember one of the signs that the holidays are here is when the unique fragrance of cozonac has reached every corner of the home, starting in the kitchen and ending in the living room. The preparation is fairly intensive, but the results are certainly worth the effort, especially if they remind you of festivities or traditions. An overview of the recipe, and the keys to getting it right. I was used to the baking another fluffy cake named pandispan: the key to keeping it fluffy is to whisk the eggs until they become airy, then gently introduce the flour into the mix (see that recipe for details). Cozonac is different in that it uses yeast to create the fluffiness, and the process is very different. Baking with yeast requires three key steps: (a) activating the yeast, (b) keeping it at proper temperatures (not too cold nor too hot), and (c) creating a proper environment for it to grow. Let’s talk about each of these in more details. (a) First of all, you need to activate the yeast. Think of the yeast as being asleep (this helps preserve its properties on the shelf for a longer period of time), and you need to wake it up such that it helps your recipe grow. The process is simple: yeast is easily activated in the presence of sugar and warm water or milk. I mix yeast and sugar in equal proportions, then I add water warm enough such that I can comfortably hold a finger in it. If everything goes well, expect to see a froth forming on top of the liquid. If you don’t get this step right, then your yeast won’t be active and your dough will most likely not rise - you're better of stopping here and just retrying this step. (b) Think of handling yeast as of playing with a delicate kid. If the temperature is low, the kid might catch a cold. If too hot, that won't work either. It is the same with yeast: you want to keep a nice warm temperature, both in the air and also on the surfaces that it touches (for example, the working surface where you handle the dough). I remember that back in my childhood, my mom would raise the temperature in the entire kitchen when cooking this recipe - this helped keep the yeast ready for action. (c) Once we put together the dough, we expect the yeast to grow. If the yeast is active, if we kept it at an appropriate temperature so far, and if we plan to keep it at an appropriate temperature from now on, then this should not be a far-off expectation. And still, I’ve followed these steps several times in the past and ended up with a dough that did not grow much. What happened? The answer lies in another important step: kneading. As I had the pandispan recipe fresh in my mind, I took it gently on the cozonac dough, and I kept my kneading short and delicate. This was a mistake: kneading is paramount to getting cozonac right. The reason is that when flour and water are kneaded together, long strands of gluten form from the expansion of certain proteins. These strands allow the growing yeast to easily stretch the dough and form bubbles of air, which is the key to achieving a fluffy cozonac. An effective kneading is simple: press the dough, stretch it, fold it back, and repeat. What is not so simple is doing it for over half an hour (stories of moms kneading for one to two hours are not uncommon). At this point, you may consider buying a mixer with dough hooks to help with the process, particularly if you plan to do this often. That’s it. A detailed list of ingredients and the preparation instructions are described next. With these in hand, you should feel empowered to prepare cozonac whenever you’re craving for it. No more thinking that you need ‘Romanian’ flour to get it right, and postponing until you actually find it (which is pretty much never). No more paying ridiculous sums to satisfy a craving: I ended up paying $42 a year ago for a cozonac half the size of what I can now do for $5. No more holidays without the house filled with the delicious cozonac smell. Enjoy! - Mix two and a half teaspoons of active dry yeast with two and a half teaspoons of sugar. Add a cup of heated whole milk (the temperature should be such a way that you can place a finger inside and comfortably hold it in there). Let sit for 30 minutes: this helps activate the yeast. When ready, you should see froth formed at the surface the milk. - Meanwhile, coat two loaf pan with butter. Melt the remaining butter on low temperature and allow it to cool to room temperature. - Carefully break the eggs and separate the whites from yellows as follows: one cup with two yellows, one cup with six yellows, and two cups with four whites each. - Whisk four egg whites, then incorporate a tablespoon of rum essence, and whisk until uniform. - Whisk six egg yellows until their color lightens up, then gradually incorporate a cup and a quarter of sugar and a tablespoon of orange peel. Whisk until uniform. - Sift the flour in a large bowl and add a pinch of salt. - Once the half an hour has passed and the yeast is activated in the milk, quickly mix it with the melted butter and with the whisked egg whites and yellows. Pour this over the sifted flour. Mix with a wooden spoon until uniform. - Now to kneading: here's where you'll have to use your hands instead of the wooden spoon. Coat your hands in oil, and start turning and ponding the dough. Periodically coat your arms with oil again and again until you use all the four tablespoons of oil - this prevents the dough from sticking to your hands, while also making the cozonac more moist. Continue kneading for at least 30 minutes. - Once kneading is done, place the dough in a warm environment (near the oven should work), cover with a towel, and let stand for 45 minutes. This is a good time to put together the filling (next step). - Whisk the other four egg whites, then gradually incorporate a cup and a quarter of sugar. Gently sift a quarter cup of cocoa powder and mix it in. Add a tablespoon of rum essence, one of orange peel, and one of coffee powder. Finally, add three cups of ground walnuts. Mix everything and set aside. - Once the kneaded dough has stayed for 45 minutes (it also hopefully grew in size to some degree), cut it in two: we will be making two cozonacs. Take each half and flatten it with a rolling pin. Add a thin layer of the filling, and optionally the raisins or turkish delight pieces. Roll tightly from two opposite sides such that clean dough meets in the middle: it helps to keep the filling in during cooking. Seal the two ends and gently twist it around - this gives it a more interesting shape when cooking. Place each twisted roll inside a loaf pan (previously coated with butter). Cover with a cloth towel and let sit for one hour in a warm place. - Finally, use the two remaining egg yellows to coat the cozonacs, sprinkle the leftover sugar on top, and optionally decorate the top with walnut halves. Place them on the lowest shelf in an unheated oven. Set the temperature to 325F and start the cooking process. Note that the cozonacs will continue to grow in size as the dough raises. Do not open the door while they are cooking, particularly during the first half an hour - hopefully your oven has an internal light and a glass front door that allows you to peek in without opening. Start keeping an eye on the cozonacs after about 25 minutes of cooking. You want their tops to have a pleasant reddish brown color: once this happens, cover them with aluminum foil, and keep cooking. The total cooking time is about an hour after the oven reaches 325F. To check when they are ready: stick a toothpick all the way in, remove it, and check that it is clear and dry. If not ready, cook for another five minutes, then check again. - Once the toothpick comes out dry and clear, turn off the heat and let the cozonacs stay in the oven for another 15 minutes. After all this, remove the cozonacs from the oven, cover them with a towel, and allow them to cook slowly. Do not cut them for the first 15-20 minutes after they were removed from the oven. - The top of the cozonacs looks beautiful, so they often don't need much help in the presentation. Alternatively, slices have intricate shapes of alternating bread and filling, with occasional spots of color from the turkish delight. A beautiful presentation in and of themselves. - A few fruits can further add color and freshness to the presentation. - Serve it alongside a glass of milk, or accompanied by a glass of wine. I have a romanian friend in my class and i think she is a good cook too. So i am gonna request her this recipe. Because it looks too tasty in the picture that i cannot resist now.